Wandering the aisles of the supermarket, not in a hurry, just looking at all the items on the shelves that you may have overlooked before can be a rewarding experience. Usually we are shopping list driven (which in itself isn’t a bad thing because it helps curtail impulse buying and ruining your budget) but on this day I was taking my time and just looking to see what’s there for the taking. A small find was a bag of mixed dry beans; great northern and pinto beans caught my eye. I’m sure I have seen them before but they never really registered. 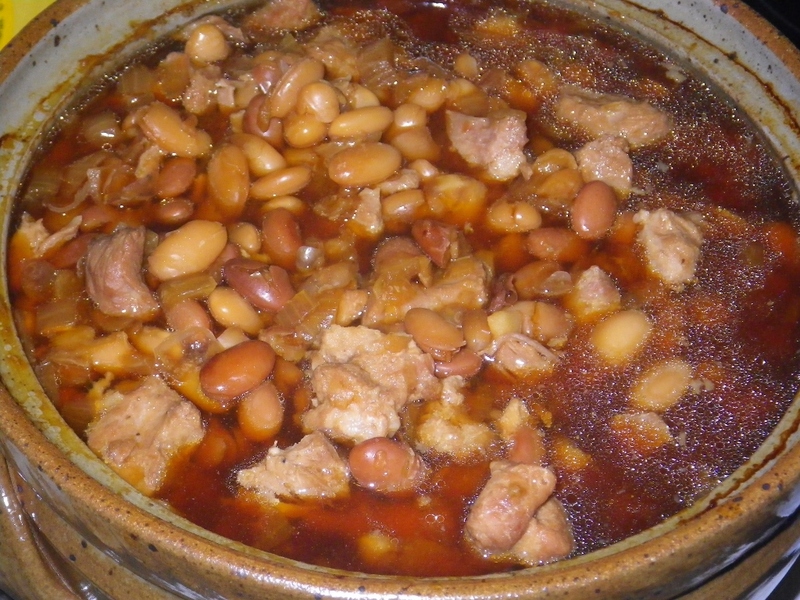 Today they struck a chord and I decided to make pork and beans from scratch using my new bean crock. I had some boneless pork ribs in the freezer and most everything else I needed at home except for this one-pound bag of mixed dried beans. Plop! They were in the cart. Inspect and cull beans. Place in a bowl or pot with a lid. Cover by 2-inches with boiling water. Allow to stand until cooled adding more water as need to keep the beans covered. When cooled, cover with additional water up to 2-inches. Cover and keep in the refrigerator overnight. The next day, drain and rinse the beans in a colander. 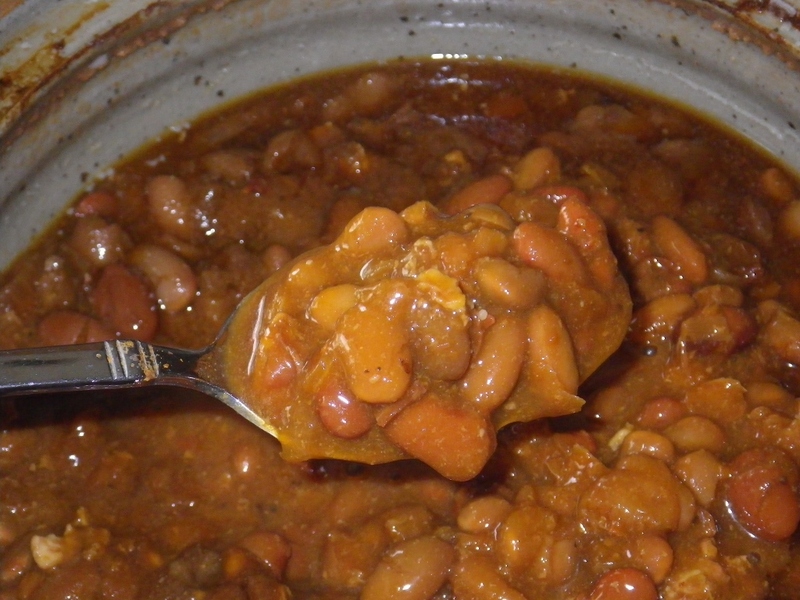 Place the beans into a cooking pan, cover with 2-inches of water and heat over medium-high heat until boiling. Reduce the heat to low simmer and cook for about twenty minutes. Check the beans after fifteen minutes to make sure they are not overcooked. While the beans are cooking, cut the ribs into tid-bit pieces and dice the onion. Add a bit of olive oil to a frying and sauté (par cook) the pork and onions until the pork has just browned. If there is any oil left in the pan add a teaspoon of flour and stir to incorporate the fat. Add the mixture to the bean crock. 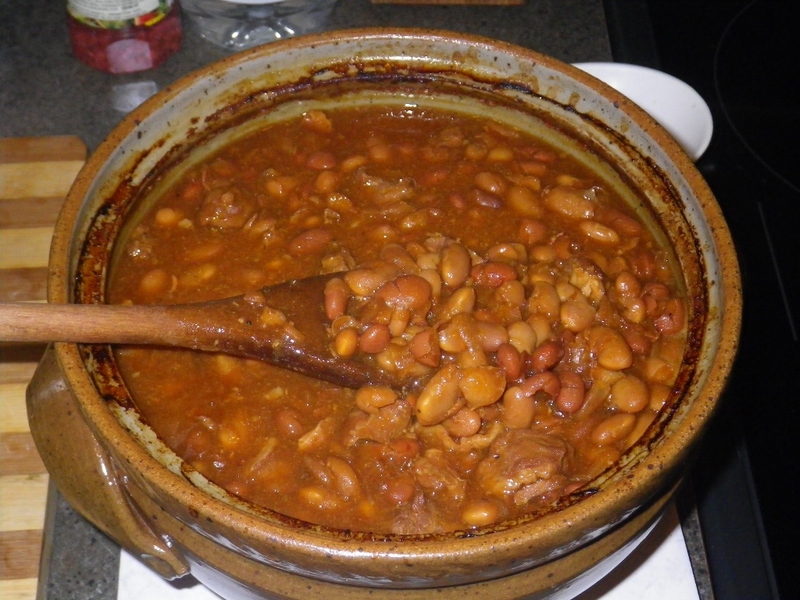 When the beans have finished cooking, drain thoroughly in a colander and then add the beans to the bean crock with the meat and onions. Add the sorghum, mustard powder,, salt, pepper and broth. Stir gently to mix and combine the ingredients. The beans are soft so mix with a folding motion. Add a bit of water as needed to fill the bean crock. Cover and place in a preheated 425°F oven. Reset the temperature to 325° and cook for 20 minutes. Reset the oven temperature to 225° and cook for an additional 1 ½ hours. Carefully remove the crock form then oven and place on a heat proof surface and remove the lid. 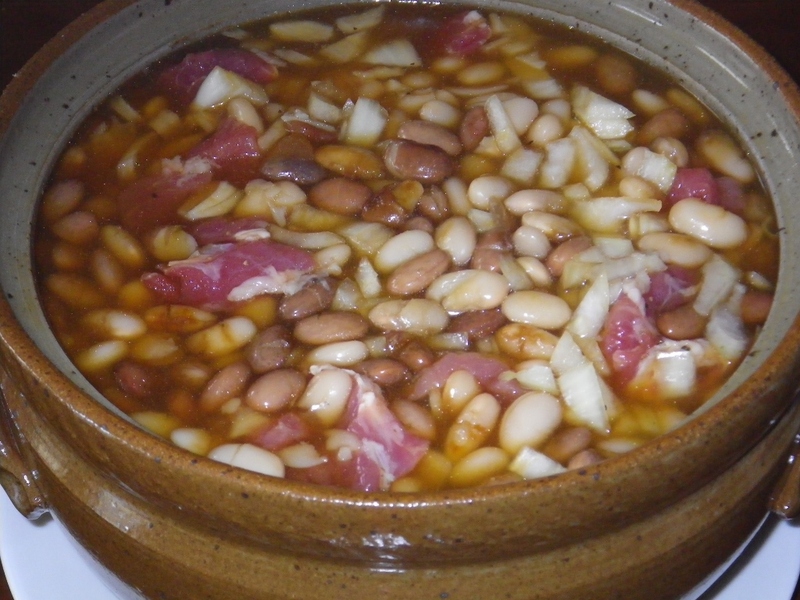 Gently stir the beans and add water, as needed, to fill the crock. Taste and adjust seasonings and sweeteners as needed to taste. Re-place the cover and return to the oven for an additional two hours. 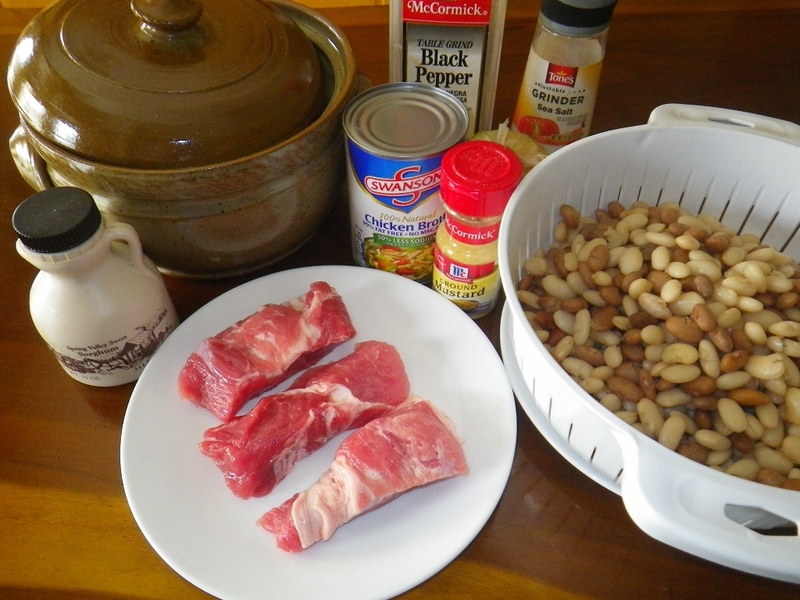 At the end of the two hours, remove the beans form the oven and allow to sit for a few minutes before serving. The beans done in this batch, with the mixed dried beans, were very good. They had good flavor imparted by the broth and the pork with a nice touch of sweetness. However, I would probably prefer in the future to use all white beans.